Enzyme Peptide Firming Mask. It exfoliates and firms. A Great pick me up. Gentle Cleanser, cleans off makeup toxins and dirt. Double hyaluronic acid, peptides to help with skin rejuvenation. When I apply Osmosis, I just use a drop of each. It can make a difference in the skin. You can mix it up to get better results. You can mix 2 products or 3 or 4. Whatever your skin can tolerate. You can change it up daily. Mix Catalyst AC 11 with one of the Vitamin A Serums. Mix Stem Factor with one of the Vitamin A Serums. Be sure to spray the Clear so your products penetrate better. Then if you want to add a moisturizer you can. Then sunscreen. Log in and receive your automatic discount in the shopping cart, or use code save. Being a registered preferred customer saves you money on all your favorite products. I also have special offers on certain products that changes every few days. Our products are always fresh and our orders go out quickly. We also offer excellent advice on how to use the products correctly. Online over 20 years. Purchase from someone you can trust. Have you been using Osmosis for awhile and need a change. I have a suggestion for you. It is only for skin that may tolerate a little stronger product. Not for sensitive skin. Use Clear, Stem Factor, Renew, Replenish and Rescue. You get anti-aging, a more clear and even skin tone.skin tone and excellent results. The Clear helps the products penetrate into the skin and extra hydration. It is anti-bacterial also. When you use Renew, you may want to start a few days per week and work your way up. Stem Factor is Osmosis number one selling product. It contains over 150 different skin growth factors, derived from adult stem cells, that create this magical serum that improves all aspects of skin aging and skin damage. It gently restores the repair process and stimulates new cells to build collagen and elastin, heal hyperpigmentation and reverse aging. 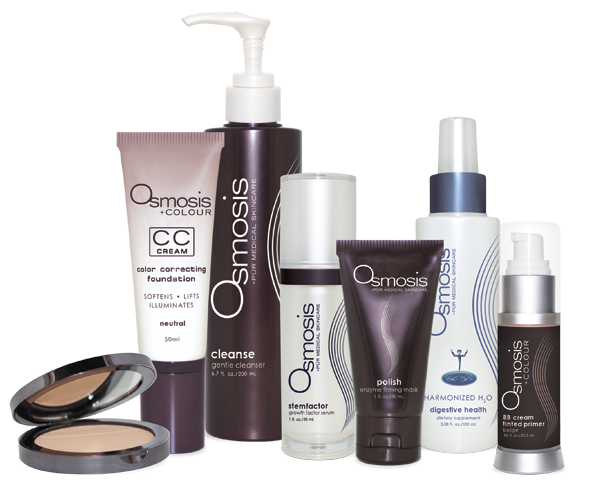 Osmosis Skin Care prides themselves on remodeling the skin. This may be for anti-aging, repairing damaged skin. Helping with acne, rosacea and more. Osmosis suggests you use a treatment serum with whatever products you choose. The treatment serums are for anti-aging, sensitive skin, remodeling, acne, and rosacea. For sure you want to purchase Clear to help the products penetrate into the skin. If you need even more help, try adding one of Osmosis powder blends. Vitamin C, Lightening Powder, Acne, Skin Nutrition for anti-aging, These again work well with the treatment serums and also with Clear. Clear is a must have product with Osmosis. Try one of their great Moisturizers. Quench , Quench Plus and Immerse for very dry skin. Shade is their moisturizer/sunscreen. Eye Serums try Refresh for anti-aging, dark circles and bags under the eyes. Refresh PM for anti-aging and hydration. And the Catalyst Family to repair the skin. Catalyst the first one, Catalyst Plus for sensitive skin and Catalyst AC11 for repairing and the strongest one. Anti-oxidants Replenish a food for the skin and Repair to heal and Polish to exfoliate. You save on every Osmosis product in the shopping cart. If you following the link will show the categories of their products. Now that the cold weather is here, is your skin getting a little dry? Try adding a small amount of Osmosis Immerse to your products. Immerse is extra hydrating. It is healing, contains powerful anti-oxidants and helps restore the barrier of the skin. You only need a small amount since it is so rich. You can add a dash to your Osmosis Quench or Quench Plus. Apply to the face and neck area for best results. Please visit my website http://www.karinherzog-jmilan.com and use the code save for your discount in the shopping cart for Osmosis. Stem Factor by Osmosis Skin Care now comes in a small size. The regular size is 30 mil and the new size is 12.5. Both are now available. This is exciting news as it allows clients to experience Stem Factor before committing to the larger bottle. If you have been sitting on the fence before purchasing, this is a wonderful opportunity for you to experience this great product. Stem Factor is far more advanced than other products that contain Stem Cells which when harvested, create grow factors. Stem Cells is a remarkable product that brings visable signs of anti-aging. Growth Factors play a role in all aspects of wound healing including collagen and elastin production, new blood vessel formation, scar tissue revision and removal, melanocyte repair and much more. As we age, our skin sees a decline in the number of growth factors available in the skin. The goal of StemFactor is to restore your skin’s growth factors to a level previously seen when we were young. It is so important that you purchase your Osmosis Skin Care products from a name you can trust. I have been online over 17 years and show my name, address, phone number and email. I am easy to reach and if you call Osmosis Skin Care, they will verify I am an excellent account. There are new websites popping up with no name of who you are purchasing from. Some of them have no address or phone number or email. You should see all of these on whatever website you choose to shop on. Automatically this should tell you that they do not want you to know where or who they are. Most of these sites do not even have a good relationship with the manufacturer. When you are using your credit card information and need help with your skin care needs, it is important to know who it helping you. Pigmentation is the worst thing possible it seems. We all seem to have it somewhere on our face. Some worse than others. You feel as thought everyone can see it. Some ethnic groups are more prone to pigmentation than others. You have to find the right product that will help you. There is no easy answer. 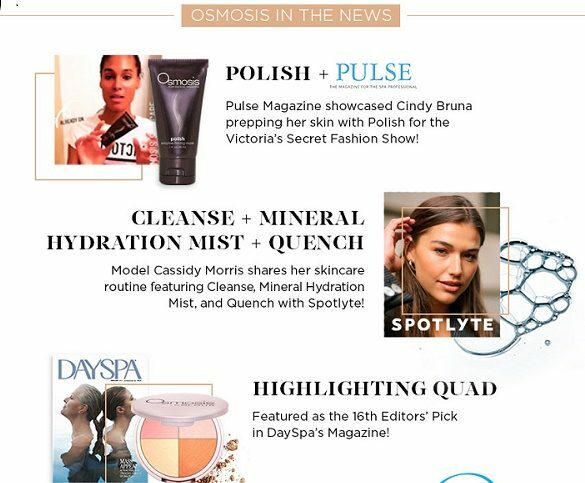 In the Osmosis Skin Care line, two new products are very helpful. Catalyst which is a wonderful amino acid mix with Vitamin C. there is nothing like it on the market. It is anti-aging, helps with acne, rosacea and of course pigmentation. Use it twice a day. The next new product is Skin Nutrition. It is stronger than Catalyst, but in a different way. Skin Nutrition is a powder you mix with other Osmosis products. It puts up a good fight against pigmentation. Your pigmentation may look darker at first, but as it calms down, so does the pigmentation. Enlighten is another product that is beneficial. It has retinaldehyde which is stronger than retinol, but gentle on the skin. Also you may add in a little Lighting Blend. A selected group of powders that work together to lighten your skin and pigmentation. Start with these. So many people end up getting laser surgery, but most of the time that is an expensive temporary answer. You will see in time, the pigmentation seems to come up again. I personally feel you would be better off using excellent products and getting a good facial peel from your esthetician or physician. You should have better results over time. Of course always wear sunscreen. If you do not, it will come back. Osmosis Skin Care makes some wonderful healthy masks for the face. Berries, Apricots, Wine or Grape. Now take it a step further. Add a little magical medifacial powder from Osmosis to give you even better results. You may purchase individual powders for lightening, hydration such as 1-3 Beta Glucan, Hyaluronic Acid or Vitamin C. Try one of the powder blends. The perfect amount of mixed powders for anti-aging, lightening, calming, menopausal skin, and acne. It is so easy. Add a few drops of powder in whatever mask you choose. Try several powders. Mix it up and apply it to the face. Leave it on for 10 minutes to start. Then when are sure your skin is adjusted to the mask, the next time try 15 minutes. Eventually try 20 minutes. Rinse with water and then finish with your favorite moisturizer. Try Replenish or Quench by Osmosis.